Amid a scorching nationwide heat wave, torrential rain exceeding 200 millimeters inundated the country's eastern Gangwon region on Monday. The latest amount of precipitation is the second-highest recorded in the area, after a downpour of 100 millimeters per hour recorded when the powerful Typhoon Rusa struck the country in August 2002. 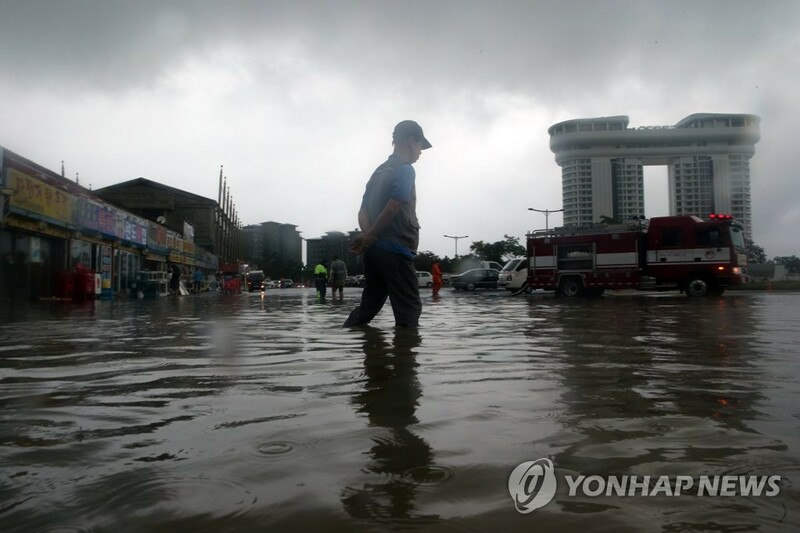 The Korea Meteorological Administration reported rain damage mainly in Gangneung, where a downpour of 93 millimeters was recorded between 3 and 4 a.m. Monday. The weather agency said between 6 p.m. Sunday and 10 a.m. Monday, more than 265 millimeters of precipitation was recorded in Sokcho, 252 millimeters in Gangmun district in Gangneung, and 180 millimeters in Hyeonnae township in Goseong.